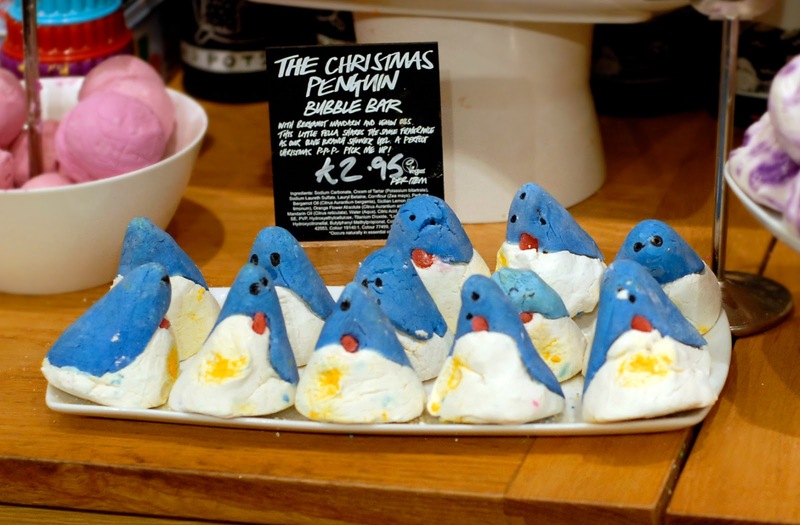 Last week I went along to Lush with a group of other Brighton bloggers to view the Christmas collection for this year and have a go at making a product from the permanent range ourselves. Lush was bright, warm and full of scents against the cold winter evening and we were greeted with bucks fizz and Cakepops. To begin we were given a demonstration of the Golden Wonder Bath Bomb and The Comforter Bubble Bar (which we later made). Golden Wonder is a large cream present shape, that rattles when shaken and is topped off with a heavy covering of gold shimmer. The present has a gorgeous orange and congac scent, and as it fizzes in the water the foam changes through yellow and blue, and there are bursts of orange, blue and pink from the little coloured balls inside that create the rattling. When the bomb has dissolved, the water is left an amazing sparkling green; it looks like liquid metal and feels silky to the touch. 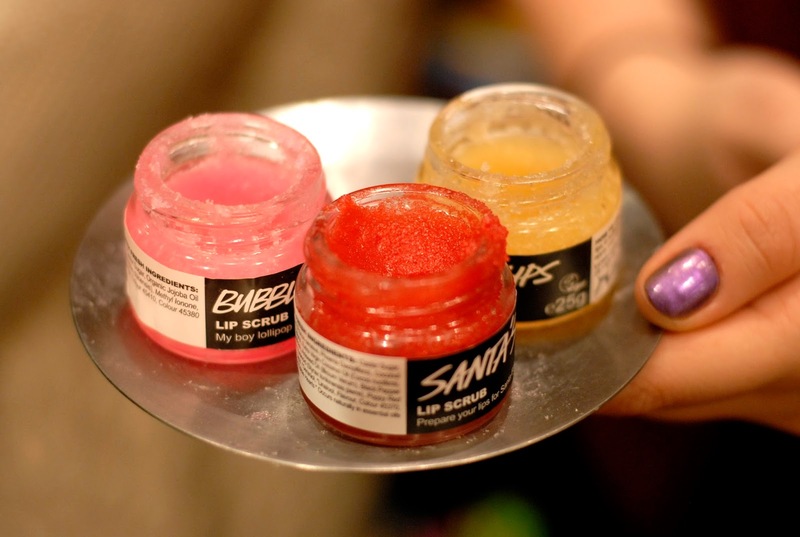 Lush have recently switched from plastic glitter to biodegradable glitter made from cracked sheets of seaweed, which becomes soft when wet and isn’t harmful to animals or the environment. The Comforter Bubble Bar is broken into pieces and one piece is added to the bathwater, where it gives a strong berry scent and turns the water a blankety pink with lots of pale bubbles. We each put on biodegradable gloves and then mixed up the separate parts of the bar. Starting with powders such as Sodium Bicarbonate and Cream of Tartar, the combination was mixed into a paste by adding the foaming agents such as Cocoamide DEA (a derivative of coconut oil) and finally, with the addition of colouring and blackberry scents, we formed two doughs- one pink and one white. The doughs were spread on top of eachother and rolled up like a Swiss Roll before being cut. As the bubble bar is solid, it doesn’t require any preservatives like liquid bath products, and I’m looking forward to diving into baby pink bathwater when I give mine a go! The Comforter is similar in scent to the infamous Snow Fairy Shower Gel (loved by women, and men! ), but I find it much fruitier and I must say I prefer it to the shower gel. 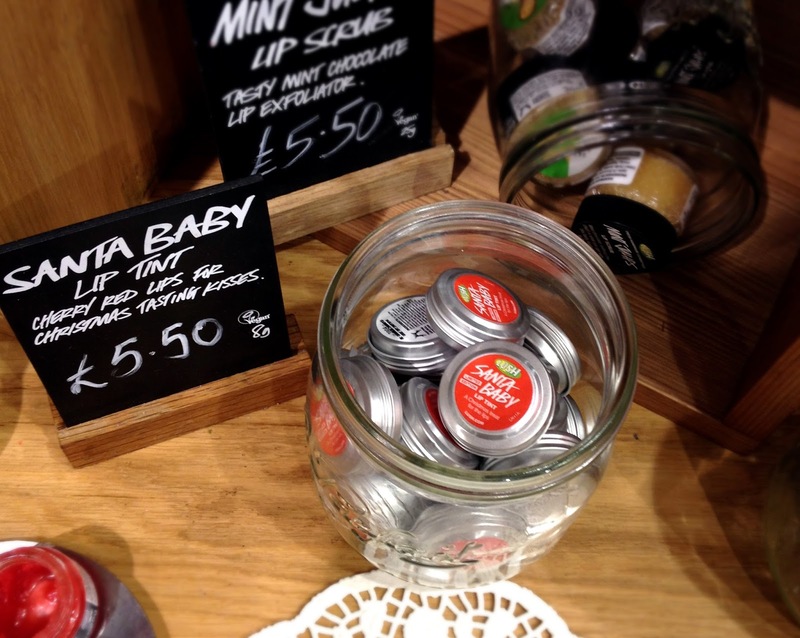 We sampled and swatched the Christmas Lip Scrubs and Tints- as well as the well-known Popcorn, and Mint Julips, Santa’s Lip Scrub is a must-have for the holiday period. This bright red cola scented sugar scrub is made with cherries and dates, which gives it a lovely warm scent, and it also includes edible red hearts for a bit of Christmas cheer. The lip tints are much more pigmented than expected, and Santa Baby is just the right shade of red to get hearts racing. It dries matte but moisturises the lips with a whole host of oils such as Rosehip and Safflower. We also sampled the massage bars which have lovely Cocoa and Shea Butter scents. They take a bit of work to warm up in the hands, and it was an unusual experience massaging the hand and arm of a stranger, but the bars produce a lot of oil when melted and I enjoyed getting to grips with them. 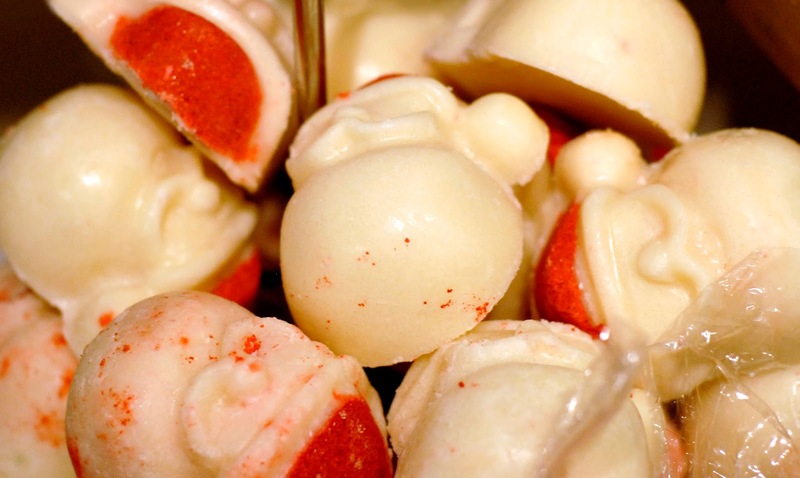 Therapy, which has solid nodules , was a favourite of mine, and I think they would make a great gift for a loved one or someone who suffers from aches and pains. Additionally we all had a good smell of the newest range of Lush Gorilla Perfumes. These look very much like something from an apothecary and are inspired by British countryside folklore. The fragrances have been designed to blend with the chemistry of the body so, unlike mainstream perfumes which are created to smell almost the same on everyone; these take on a different scent from person to person. The scents are mysterious, presented in dropper bottles with names like Hellstone, Lord of Goathorn and Devil’s Nightcap. Many of the scents are deep and woody, with Coffee and French Cigarettes being a feature of The Voice of Reason, and unearthed roots featuring in Hellstone. For those of us that enjoy lighter floral scents there is Flower’s Barrow and bestselling Sikkim Girls with Jasmine, Frangipani and Blackcurrant. I will definitely be back to sample the latter two on my skin and see how they change! As well as Golden Wonder, the Christmas bath range is an absolute treat to see and smell- cute little Penguins smell of Sicilian Lemon, Melting Snowmen emit the scent of Hot Toddy, Cinders with red popping candy emanates warn cinnamon, Bombardino smells of warm gingerbread, and a smiling pink Father Christmas creates green bathwater with a festive orange fragrance. My favourites of all the products I sniffed (which was a lot!) were bright and fresh looking- the Star Light, Star Bright Bath Melt is a star drenched in silver shimmer, that contains Lavender, Lime and Ginger Oils so smells zesty but warm at the same time, and the pure white So White Bath Bomb has a crisp apple scent and a secret rose coloured centre to leave the bathwater pink. In the past I have mainly been into Lush for presents for others, and have only tried a few products of their extensive collection myself. After being overwhelmed by the scents and bright colours of the store, I purchased a Jumping Juniper Shampoo Bar as a little gift for myself, which has a lovely fresh floral scent and is perfect for greasy hair. I’m so excited to give this a try as an alternative to my boring Baby Shampoo! One of the things that’s clear after visiting Lush is how animated, helpful and knowledgeable all the staff are- it’s obvious that they really love their job and know their products inside out to be able to helpfully answer any questions. 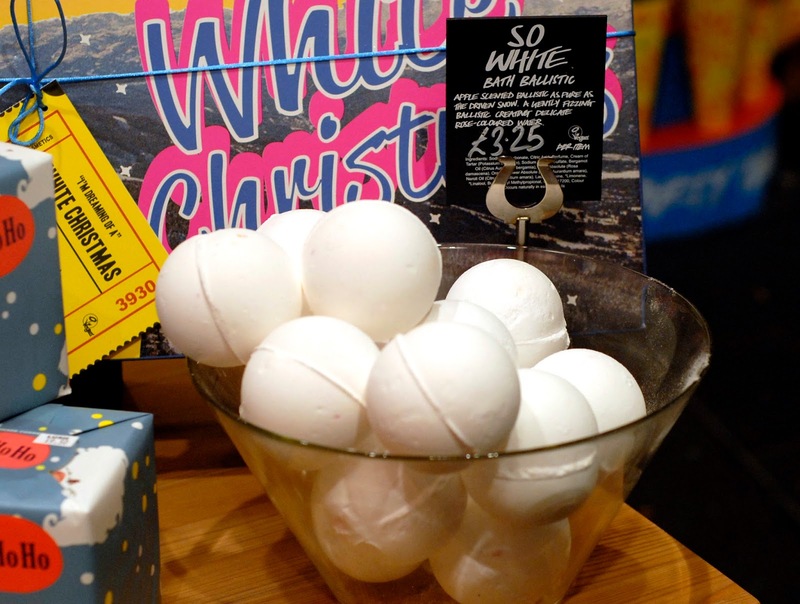 Everyone loves a bit of a pamper, and whether you’re buying Christmas gifts or a little present for yourself, Lush will definitely have a scent you love, and once you’ve smelt the Christmas collection you’ll want to keep going back! Wow, sounds like you can take a lot in from one evening! So many things I have just added to my xmas wishlist! Check me out if you like and let me know if you know of any other Brighton bloggers!